State Level Police Recruitment Board, Andhra Pradesh (herein after referred as SLPRB,A.P.) invites application through ONLINE mode only in the prescribed proforma to be madeavailable on WEBSITE (recruitment.appolice.gov.in) from 03-08-2016 at 1000 hours to14-09-2016 at 1700 hours for the following posts. The number of vacancies indicated is onlyprovisional and is liable for change without giving any notice. SLPRB, A.P., reserves the right tonotify the modifications with regard to any aspect of recruitment during the process of recruitment. Post Name:- SI, ASI & Constable. community certificate (for BC/SC/ST candidates) while submitting Online Application Form. 10 days before the date of Preliminary Written Test. Applicant those applying in Constable, Sub Inspectors, Assistant Sub Inspectors and Home Guard jobs published by AP Police Department should have following age. 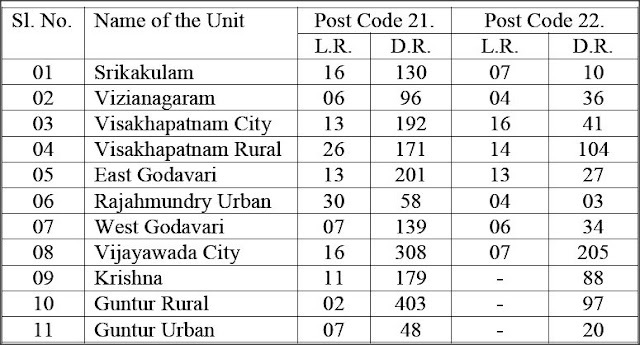 Age relaxations are applicable for different reserve categories candidate as per the AP Government rules. For the post code Nos. 21 and 22 – Candidate age should be in between 18 to 22 Year (as on 1st July, 2016). Note – Applications submitted after 1700 hrs on 14.09.2016 will not be accepted. Incomplete applications will not be entertained. All AP Police Recruitment 2016 Notification detail is present on this website with detailed information of AP SI Jobs 2016, Andhara Police ASI Notification etc. Applicant can also get information like AP Police admit card, Result, Syllabus and AP Police Exam Date. How to Apply:- As we all know that all AP Police Recruitment application is submitted by online through the AP Police website so all applicant should know how to apply in AP Police Jobs Recruitment 2016 and for that we listed some important steps about that. All candidate go through that before applying in that. Visit the official site " www.appolice.gov.in "
Now Click on the apply online tab of the Respective AP Police Vacancy. Fill the application form carefully without any mistake . Pay the fee though given way. Take a print out or save the application form for future usage.